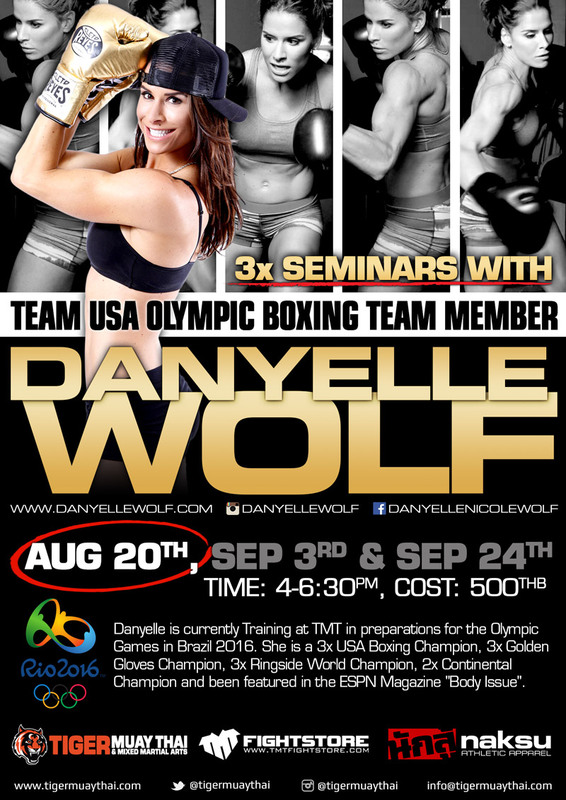 If you missed Team USA Olympic Boxing team member Danyelle Wolf Seminar at TMT last July which was a hit, now is your chance to have another opportunity to learn from a World Class and Olympic boxer. Wolf will be having a series of seminars during her stay at TMT over the next few months while she is training for the 2016 Olympics in Rio de Janiero, Brazil. Wolf’s accomplishments are she is a 3x USA Boxing Champion, 3x Golden Gloves Champion, 3x Ringside World Champion and 2x Continental Champion. Wolf has also been featured in ESPN Magazine’s “Body Issue” and has appeared in the TV shows Steve Austin’s Broken Skull Challenge and American Ninja Warriors. Don’t miss this chance to learn from a high level boxer! Everyone from beginners to professionals are welcome. Cost is 500 THB per seminar.